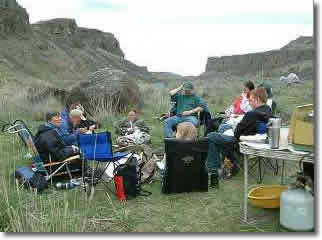 On the first day we gather at an agreed upon place and travel together to a wilderness basecamp. The first days are given over to preparation (Severance). We meet in circle and practice “council” so that all voices may be heard. Participants will learn about the 4 Shields of human nature, wilderness safety and ethics, self-generated ceremony and go through an interactive interview to clarify their intention in marking their adulthood. They will also explore the nearby land for a place to solo and establish a “buddy pile” (see handbook for description) during this time. On the fourth, fifth and sixth days the trainee lives alone and fasts in a wilderness place (Threshold or Solo Time). On the morning of the seventh day, the fasters return to basecamp and a celebratory feast is held in a nearby town (Incorporation). Days eight and nine are spent in circle telling the stories brought back from the wilderness. Each faster is heard and his/her story empowered by a council of elders and initiates are also prepared to reenter their lives as young adults.